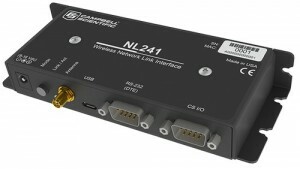 The NL241 provides Wi-Fi connectivity to dataloggers and peripheral devices over standard 802.11b/g/n networks. The NL241 is a wide-operating-temperature and low-power-consumption device, making it ideal for providing Wi-Fi client and access point functionality in demanding and remote applications. The wireless access point feature allows any Wi-Fi device to connect, including your PC, phone, tablet, or even another NL241 or NL240. It can be always on, cycled on an off under program control, or brought up with the touch of a button. Unlike the NL240, the NL241 is a true access point and does not rely on ad hoc networking.